The horror community was spitting venom in the early 2000s when talk of a remake of Dawn of the Dead first hit the internet news cycles. After all, it’s one of the most beloved and respected horror films of its time and the thought of cashing in on it for a quick buck didn’t sit well with that many people. It wasn’t until the remake’s trailers and TV spots came along that the tide finally began to change in its favor. Now heralded by many as one of the better horror remakes, Zack Snyder’s (and to a large degree, James Gunn’s) Dawn of the Dead is a different beast than that of Romero’s, and depending on who you ask, its modern-day equal. 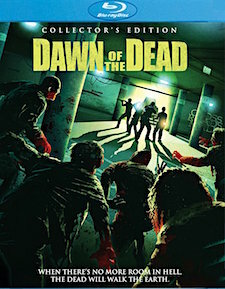 To some degree, many of Dawn of the Dead’s story elements are the same. People are trapped in a mall and they’re surrounded by zombies. Characters, dynamics, and outcomes have been changed completely and gone altogether is the consumer subtext of the original. Now we’re trapped with a group of people who are fairly questionable on most levels, which is why it’s difficult for me personally to enjoy this film all the way through. Ultimately, I find much of it not that pleasurable because many of the characters are written to be so repugnant, not to mention that there are way too many of them. I understand that James Gunn’s and Zack Snyder’s intent was to portray characters with the worst traits who can still manage to come together in the end, but for me, it’s just not that much fun to watch. It’s also the complete opposite of the original film, wherein you like the characters and you want them to succeed. I frankly don’t care if most of the folks in the remake survive or not. On the other hand, this new Dawn has one of the best openings for a horror movie of recent memory, which grabs you by the throat and makes you sit up and pay attention. It also illustrates the situation at hand quite well, but it’s nearly everything that happens afterwards that loses me. And honestly, I don’t mind the zombies being fast. It’s a different take and it’s something that has slowly but surely gone by the wayside over the years anyway. There are sporadic moments of interest, such as Kenneth and Andy’s relationship, the Dead Reckoning-like vehicle at end (not a coincidence, I’m sure), and all of the practical special effects work. It’s just that’s it all in service of characters that I can’t sincerely root for. To each their own. Scream Factory’s Collector’s Edition Blu-ray of Dawn of the Dead features both versions of the film, the theatrical and the uncensored director’s cut, the latter of which is truly uncensored for the first time on home video in the U.S. Both also feature new transfers taken straight from the film’s digital intermediate with HD inserts used for the unrated version. It’s always been an aggressively stylized film and although it isn’t that old and was released on the format less than nine years ago, there’s still some marginal improvements with this new transfer. Grain levels, although still a bit patchy, are slightly more even keeled. Detail is also a tad bit enhanced. However, the color palette is the major difference, and by major I mean not all that much. Reds have been redacted slightly, which makes all of the other hues slightly more natural. Black levels are a bit of a mixed bag but are solid for the most part, while overall contrast and brightness levels are satisfactory. There’s no evidence of digital scrubbing but some extremely minor speckling is present. The audio is presented in Scream’s usual English 5.1 and downmixed 2.0 DTS-HD combo. The go-to of the two is the 5.1, which is a forceful surround track with loads of atmospherics and ambience, as well as deep, booming LFE. Dialogue is crystal clear while score and music are given plenty of fidelity. There really isn’t much worth complaining about at all. It’s a great track. Subtitles are also provided in English if needed. As for the supplemental material, all of the film’s previous extras have been carried over from its various DVD and Blu-ray releases, including those from the Best Buy exclusive release. It’s also worth noting the picture-in-picture option from Universal’s disc isn’t replicated here, but that the material used for that particular feature is. On Disc One, which contains the theatrical version, there are several new interviews, including Take a Chance on Me: Ty Burrell Talks Dawn of the Dead; Gunn for Hire: Reimagining Dawn of the Dead, an interview with James Gunn; Punk, Rock & Zombie: Jake Weber Talks Dawn of the Dead; and Killing Time at the Mall: The Special Effects of Dawn of the Dead, an interview with special make-up effects artists David Anderson and Heather Langenkamp. There are also 9 deleted, extended, and alternate scenes with optional audio commentary from director Zack Snyder and producer Eric Newman; the film’s theatrical trailer; and a photo gallery slideshow. On Disc Two, which contains the unrated version, you’ll find all of Universal’s previous extras. They include a non-optional introduction to the film by director Zack Snyder; an audio commentary with Snyder and producer Eric Newman; a set of featurettes (Splitting Headaches: Anatomy of Exploding Heads, Attack of the Living Dead, Raising the Dead, Drawing the Dead); The Lost Tape: Andy’s Terrifying Last Days Revealed short film; the Special Bulletin: We Interrupt This Program! newscast; Undead and Loving It: A Mockumentary; a set of side-by-side Storyboard Comparisons; and an Easter egg (found by pressing up while hovering over “Bonus”), which is the Surviving the Dawn featurette. The only materials not included (that I’m aware of) are some additional but brief cast interviews found on a French Blu-ray release. Otherwise, it’s a complete compendium. While I have my own misgivings about the film, I know there are some big fans out there of the 2004 version of Dawn of the Dead, and they have a right to their opinion. For the most part, it just isn’t my cup of tea... which could change ten years from now, who knows? Thankfully, I’ll have Scream Factory’s fantastic Blu-ray release of the film on my shelf in case I ever need to revisit it again and find out.